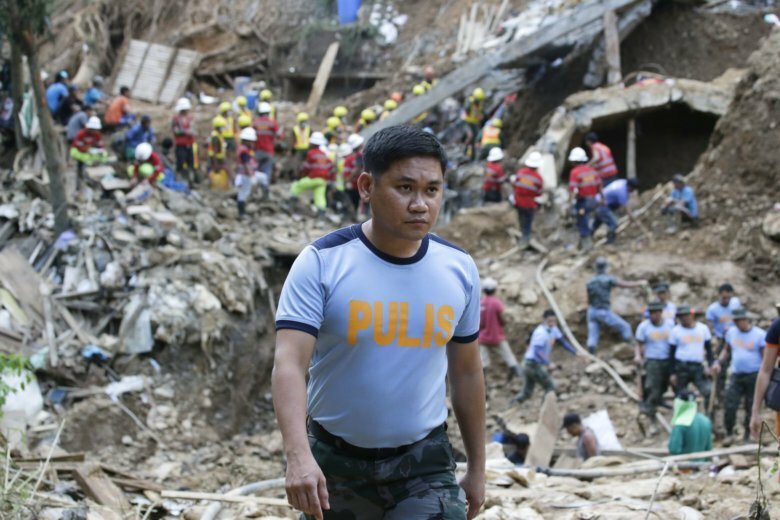 ITOGON, Philippines (AP) — A Philippine police officer who tried to persuade residents of a mining camp to move to safety as a powerful typhoon approached said Tuesday they refused to leave, and a day later the storm triggered a huge landslide that buried dozens of people. Police Senior Inspector Heherson Zambale said in an interview with The Associated Press that he was stunned after learning that the massive landslide had covered a chapel and bunkhouses in the mountain village where he and other officials had met with some of the victims a day before the tragedy struck on Saturday. Typhoon Mangkhut, the most powerful storm to hit the Philippines this year, left at least 81 people dead and 70 missing, mostly in the avalanche in the gold-mining town of Itogon in Benguet province. The storm later blew on to Hong Kong and southern China, where it caused more deaths and damage. Zambale said he and other local officials tried to convince the villagers, mostly small-scale miners and their families, to move to a safer evacuation center as the typhoon approached. A villager officer who accompanied Zambale used a megaphone to warn people that Mangkhut was extraordinarily powerful and everybody should leave, he said. The villagers told the policemen that they thought the chapel and nearby bunkhouses were on stable ground, and that they would only move away if the storm became severe, he said. Zambale said he saw about 15 villagers outside the chapel and bunkhouses. “Some were smiling and there were some who were just quiet. Some were listening to us,” he said. Police photographs obtained by the AP showed the officers in hard hats and light green raincoats talking with the villagers outside of what appears to be the concrete chapel and nearby bunkhouse, with piles of sandbags nearby. Part of the mountain slope, covered in green foliage, can be seen behind the buildings. Zambale, who has battled insurgents and criminals for eight years, said he had a bad feeling about the clearing where the buildings stood near a river, surrounded by tall mountains. Some villagers heeded the warnings and left before the typhoon struck. “But many were left behind,” Zambale said. Rescuers have recovered 14 bodies from the avalanche and at least 58 other people remain missing, he said. Itogon Mayor Victorio Palangdan said Monday it was unlikely any of the missing are still alive, although rescuers continued to search. Regional police commander Rolando Nana said a special police unit scanned the landslide-hit area with radar that can detect heart beats, but found no sign of life. As more than 300 rescuers, including police and soldiers, used shovels and picks to search for the missing, Zambale said he still remembers the faces of the villagers he tried to convince to flee. Associated Press journalists Jim Gomez and Bullit Marquez in Manila, Philippines, contributed to this report.